Station Hollywood: Happy birth anniversary of legendary royal actor Pradeep Kumar. Happy birth anniversary of legendary royal actor Pradeep Kumar. Viewers of Bollywood films wish Happy birth anniversary to brilliant actor Pradeep Kumar on 4th January, 2018. Whenever any reference relating to everlasting singer Mohammad Rafi comes, the attention goes to the big budget films and songs for big banners. Rafi is known the most for singing catchy numbers for Shammi Kapoor under the composition of Shankar Jaikishan and classical songs for Dilip Kumar under the composition of Naushad Ali. Although Rafi had sung brilliant songs for all the leading actors of 40s, 50, and 60s, much had been written about the successful films where both the songs and the films did excellent business. But Rafi had sung excellent songs for Pradeep Kumar under the composition of Roshanlal Nagrath, where even if the mass was not touched, the class was addressed and the royal andaz of singing showed the range of Rafi to suit his voice for any form of playback singing. The magic of Roshanlal Nagrath, Pradeep Kumar and Mohammad Rafi started in Aarti released in 1962. Phani Majumdar directed the film. Four of the songs of Rafi stand out, “aapne yaad dilaya”, “ab kya misaal doon”, “baar baar tohe kya” and “tere bin lage na jiya”. Some of them were solo songs, while others were duet songs sung with Lata Mangeshkar. There were other duet songs of Rafi with Asha Bhosle, but the ones in pathos andaz like “aapne yaad dilaya” mesmerized the audience. The lyrics of Majrooh Sultanpuri, the composition of Roshanlal Nagrath, the voice of Mohammad Rafi and lips of Pradeep Kumar made the viewers spellbound. None of the songs had lost their charm even today. The magic continued in the film Tajmahal in 1963. M. Sadiq directed the film. Pradeep Kumar played the role of Shahjahan while Beena Roy played the role of Mumtaz Mahal. Here the combination was different with Sahir Ludhiyanvi writing the songs for Roshan which were sung by Mohammad Rafi. Four of Rafi’s songs were masterpieces including “jo wada kiya wo nibhana parega”, “paon chulene do phulonko inayat hogi”, “chandi ka badan”, and “jo baat tujhme hai”. Roshanlal Nagrath won the filmfare award for the best composer only once in his life, that was for the composition of the music of the film Tajmahal. He deserved it many more number of times. Sahir Ludhiyanvi won the best lyricist award for the lyrics of the film. Rafi was as outstanding as Pradeep Kumar in the role of Shahjahan. The magic continued in the film Chitralekha in 1964. Kidar Sharma directed the film. Pradeep Kumar, Meena Kumari and Ashok kumar played the main roles. Rafi’s song “man re tu kahe na dheer dhare” is still considered one of the 10 best bhajans Rafi had sung. Sahir Ludhiyanvi wrote the songs of the film. Rafi’s other song “cha gaye badal” was equally impressive. The Roshan, Rafi, Pradeep Kumar combination continued in the film Bheegi Raat in 1965. It was directed by Kalidas. Rafi’s songs in the film “dil jo na keh saka”, “aise to na dekho”, “jane wo kaun hai kya naam hai”, “mohabbat se dekha” all were masterpieces. Some were duets with Suman Kalyanpur, while the others were solo songs sung by Mohammad Rafi. Lyrics were written by Majrooh Sultanpuri. The words were excellent. Rafi was unparallel in all the songs. The combination continued in the film Bahu Begum in 1967. It was directed by M. Sadiq. Rafi’s songs “hum intezar karenge tera qawamat tak”, “dhoond ke layun kahan se”, “vakiv hoon ishqgade” were all masterpieces. While some had ghazal andaz, the others were stand out qawallies with Manna Dey. Roshan was as brilliant as Mohammad Rafi as Sahir Ludhyianvi. 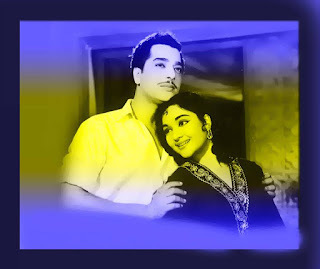 In the same year, the combination was sublime in the film Noorjahan. Rafi sang the songs “aap jab se kareeb aye hain” and “wo mohabbat wo wafayen” in style. For a change the lyrics were written by Shakeel Badayani. The unfortunate death of Roshanlal Nagrath in 1967, ended the journey of Rafi with Roshan and Pradeep Kumar. Otherwise masterpieces after masterpieces could be created. Rafi’s archive should preserve the songs of Pradeep Kumar and Roshan, which showed the royal andaz of music existing in the courts of Mughals, Pathans and Sultans in India.